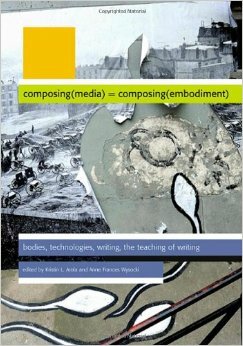 While Arola and Wysocki compile a compelling collection of essays that span a variety of genres to illustrate our relationship with media, our bodies and composition, this collection lacks the synthesis and contextualization needed to make composing(media)=composing(embodiment) a viable teaching text. While the cover of the book is visually compelling, (an old photograph withering away to reveal contemporary graffiti) the text itself is sparse with visuals and solely in black-and-white. The text itself is situated in narrow columns. While some essays include font changes, bulleted points and bold headings, these are the only visual deviations in the text. Even essays that discuss visual rhetoric such as Wysocki’s “Drawn Together” only utilize visuals in black and white. The opening pages of Part 1 and Part 2 only consist of a series of two or three questions, presumably to be answered by the following assemblage of texts. While thought provoking, these questions alone do not provide adequate introduction to the text, especially for students who are unfamiliar with the concepts addressed within the text. Also, the two collections of essays in Part 1 and Part 2 (“media=embodiment” and “mediating bodies ^ mediated bodies”) are not distinct enough on their own to justify their separation or their lack of contextualization to each other. The titles of each section, while visually and rhetorically interesting, do not provide enough information for readers, particularly students just being introduced to the idea of embodiment in composition practices, to discover the meaning of the titles on their own. While this book is structured with visually intriguing titles, the titles themselves exist without a context from which the reader can draw their meanings. Most importantly, since this book claims to “provide students openings for exploring how the media with which they work encourage certain embodiments” (Arola and Wysocki 3), there is a surprising lack of intentional connection between the essays collected and the heuristics provided at the close of each section of the book. With only leading questions at the beginning of Parts 1 and 2, and heuristics that, while useful for students and teachers practicing composing with a concentration on embodiment, do not connect in detail to the previous essays, the text fails to adequately meet the needs of a teaching text. This text could serve a graduate level rhetoric course better than an undergraduate composition course. Arola and Wysocki seem to have placed graduate level theory with undergraduate level writing exercises, and while this combination might serve an instructor familiar with embodiment in composition theory, the lack of contextualization amongst the collected essays and the heuristics forces most readers to draw their own conclusions about how to synthesize the text. While composing(media)=composing(embodiment) serves as a rare and much-needed site of theoretical and genre intersection, the text does not adequately meet the needs of a teacher seeking to introduce the idea of embodiment students. This text would be a useful supplemental text in a variety of rhetoric and composition courses. Moreover, this book provides intersection with disciplines such as disability studies, queer studies, and gender studies. All of these disciplines fall under the umbrella of concerns of rhetoric, computers and composition, but not often in the same collection. Ultimately, composing(media)=composing(embodiment) presents an exciting place of intersection in which we, as scholars, teachers and students, examine how our bodies are shaped, and shape the media with which we interact on a daily basis. As the field of rhetoric and composition begins to address new, multimodal, multinational and multi-linguistic methods of composing in the classroom, it is becoming more important than ever to consider the potential for the body and identity within composing practice and theory. The field of rhetoric and composition is beginning to, in earnest, consider the rhetorical and ethical implications for the body as we examine composition through a new multitude of different lenses and modalities. Arola and Wysocki present one of the first texts to consider embodiment through intersecting theories and practices and in so doing, set a precedent for more texts with valuable intersections of theory and practice.